As i have already talked about what nlite is and what it can do in my previous post, today in the same series i would talk in detail about nlite. What capabilities it has and how much you can customize your windows XP using this tool. I made a simple video about how to use nlite and uploaded it to Youtube. You can watch the video below too. Using Images too i will explain a bit , how to use it. You need to download nlite from its site and after that install it.You need .NET framework 2.0 installed on your system for nlite to run. Along with that you need to have Windows XP CD with you. 1. Copy the Windows XP CD to a local folder on your desktop or some other place on your system. 3.Next, select the location of your XP installation source. 4. When prompted, make sure at least “Integrate a Service Pack” and “Hotfix Integration” are selected. If other options are desired, select them as well. 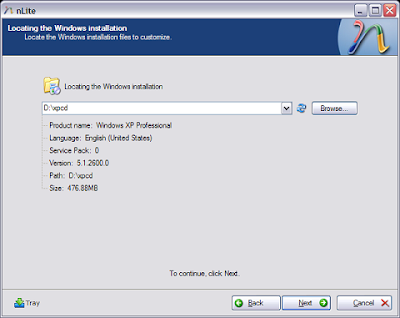 5.Select the location of your XP Service Pack network install EXE. 6.After Service Pack 2 is integrated, the nLite wizard will refresh the window to reflect the updated version. 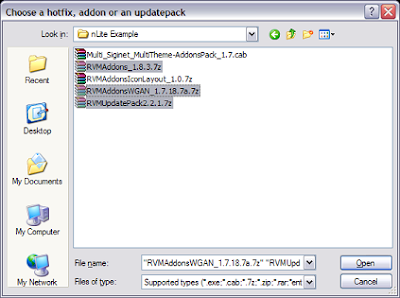 7.When you reach the Hotfix Integration stage of the nLite wizard, click the “Insert” button and select the Update Pack archive file and any addon packs you want to use. NOTE: Do NOT try to slipstream the EXEs for hotfixes already included in this pack! It is completely unnecessary and likely to cause major problems! 8.When a compatible Update or Addon Pack is added, the window will update with the hotfix’ information. 9.Continue in the wizard with whatever other options you chose on the first screen. nLite will do the rest.